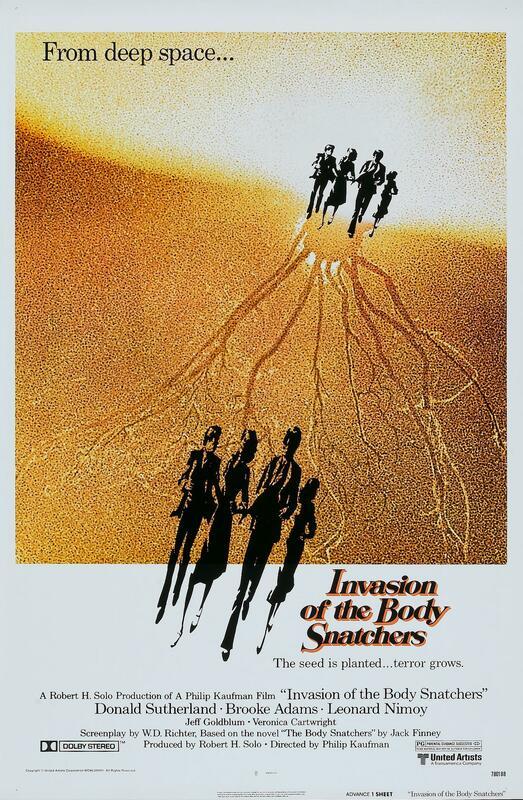 Released in 1978, Invasion of the Body Snatchers is a remake of the 1956 movie of the same name, which is also based off a novel, written by Jack Finney. Some people see remakes as inferior films just as a rule and since the turn of the century when it seems every major horror film has been a remake many people forget that a remake can be just as good if not better than the original and that brings us to the 1978 version of Invasion of the Body Snatchers. In many ways the 1978 version just might be the best version of this franchise. The screenplay by W.D. Richter was excellent and well plotted and takes elements from the original film and novel and improves on it while adding some new elements that take this movie to the next level. The characters are well developed and likeable and that raises the stakes of the suspense since we the audience become attached to the characters. These kinds of movies aren’t always well written, but can still work. I can name several great horror flicks that are great, but featured ok writing and it was the direction and or music that elevated them, but in the case of Invasion of the Body Snatchers it was a mixture of all of these things. The screenplay is heavily based on the characters and how they react to the events surrounding them and the characters are more than strong enough to carry the picture. When the action does kick in the movie is still driven more by the characters rather than the action. Richter could have taken the easy way out and simply do a basic rewrite on the original, but instead he adds onto the original and again adds a few new things. As stated earlier the characters are great, and W.D. Richter wrote simply a terrific and chilling screenplay. As I write this review I’ve never seen any of Philip Kaufman’s movies except for Invasion of the Body Snatchers, but with this movie he creates a masterpiece of Sci-fi/Horror. From the very opening shot, Kaufman creates a tone for the movie, which I feel is very important; right away we get the sense that something isn’t quite right and as characters pass we get the sense something is very wrong. As the invasion starts, Kaufman is really able to deliver a great sense of paranoia as we have no idea who’s been replaced by the pods. A lot of the camera shots are simple techniques such as the camera kinda moving wildly to show the confusion and paranoia of what’s happening and simple close ups that sort of cut everything out except the characters to make you feel isolated. These are things many horror movies use and it’s always effective and maybe even more effective here. The pacing of the film is excellent as every scene in the movie somehow moves the story forward in terms of plot, characters and suspense. Like I said from the very first scene of the movie Kaufman sets a tone for the movie and creates a very bleak tone that is highly chilling; once the sense of paranoia sets in never once does it let up throughout the picture. In my opinion this is as close to perfect direction as you’ll get. Despite how well written the movie was without the right director it could have been boring, but Kaufman does an excellent job and with his direction and Richter’s script, they create one of the great Sci-fi/Horror flicks. All these elements of the film would have been lost with a lesser cast, but Invasion of the Body Snatchers has one of my all-time favorite casts and the action is brilliant. If this were some splatter flick the cast wouldn’t be as crucial, but when a movie focuses on the characters if the acting isn’t strong no matter how well written and directed the movie will suffer. Donald Sutherland as Matthew Bennell and Brooke Adams as Elizabeth Driscoll are the leads and both are brilliant in their roles. Sutherland is one of my favorite actors and in my opinion this was his best performance; while I haven’t seen as much work with Brooke Adams I have seen enough though to be a fan. Both Sutherland and Adams work so well together and it’s quite difficult not to get attached to them. Jeff Goldblum as Jack Bellicec is excellent like always, and in typical Goldblum fashion his character is a bit out there, but is highly likeable and entertaining and Veronica Cartwright as Nancy Bellicec is also solid; Cartwright might have the smallest role of four main characters, but the writing is strong enough as is Cartwright’s performance that she feels just as developed as the lead characters and not forgotten is Leonard Nimoy who is excellent as Dr. David Kibner. Invasion of the Body Snatchers isn’t the type of movie that will have the audience jumping out of their seats and in many ways that is the best thing about the movie. Any average or even below average filmmaker can create jump scares and most of the time we jump more as a reaction and not because we’re scared. But after the movie we quickly forget the only jump scares that work are the ones that are set up (see Wait Until Dark), but this movie aims to be chilling and that’s how it scares you and in my opinion it’s movies like this that leave a lasting effect on the viewer. It takes a lot more talent to create such a suspenseful and chilling movie filled with paranoia and I’d go as far to say Philip Kaufman did a better job at that here than Roman Polanski did in the brilliant masterpiece Rosemary’s Baby. Another reason this movies works so well is simply because of the characters. Since we get to know them so well it raises the stakes when they are in danger. They are likeable and we want to see them survive and not become one of the pod people. Once that final hour hits its non-stop suspense now as the characters are in danger the suspense level hits big time. And again I also love the sense of paranoia this movie has. Once the invasion starts happening you don’t really know who’s who. It seems like the whole city has been taken over, which most people were, but you just don’t know who is a pod and who isn’t. My favorite part of the movie are the cameos by Kevin McCarthy who of course was the star of the original 1956 version of Invasion of the Body Snatchers, he’s credited as the running man, he’s the one that warns of pending danger. And of course the cameo by Don Siegel who was the director of the original appears briefly as the Taxi Driver. The ending of the movie was pure brilliance, which I will not spoil. To my surprise a lot of people debate the ending. I thought it was quite clear what happened. You don’t get the typical Hollywood ending and as much as people complain about it when they don’t get it they seem to complain more. The ending of the movie was quite chilling and is a scene that will leave a lasting imprint on the viewer. Invasion of the Body Snatchers is one of the very best movies you’ll find in the horror genre. The tone of the movie is dark and bleak and while it’s not action packed the movie is so well done it doesn’t need action to be scary. As much as I love the original 56 version, the remake is the definitive Body Snatcher movie. Look for Robert Duvall in a cameo in the opening as the priest on the swing.